Dr. Tillman and his Fort Worth team take a comprehensive approach to treating the whole patient. That means we do more than just fix teeth. We are happy to accommodate patients who struggle with feelings anxiety or nervousness. For some, a warm blanket, a comfortable neck or leg pillow, or a TV might be enough to soothe a patient’s worries during a routine or complex procedure. 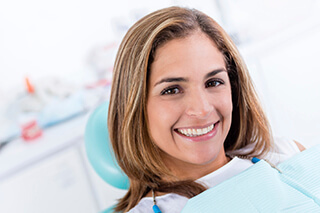 For others, though, sedation dentistry offers the best hope of creating a comfortable, stress-free experience. Nitrous Oxide – Also known as laughing gas, nitrous oxide is breathed in through a mask to provide sedation to patients with mild to moderate anxiety. Once breathed in, it will create a sense of giddiness or euphoria, as well as a feeling of numbness. However, the effects of nitrous oxide only last for as long as you’re breathing it in. That makes it gentle enough even for young patients. It also means you can drive yourself once your appointment is done. Oral Sedation – For patients with more advanced feelings of anxiety or fear, oral sedation may be the more appropriate option. Oral sedation uses a prescribed medication to create a deeper sense of relaxation. You’ll simply take your medication an hour before your appointment. Then, by the time a friend or family member has driven you to your appointment, your medication will have taken effect. During your appointment, you will feel extremely relaxed and unconcerned about your visit. The effects of your sedative will wear off hours later, leaving you with little to no memory of your procedure. Oral Sedation with Nitrous Oxide – For some patients, the best option is actually a combination of nitrous oxide and oral sedation. Absolutely. Both options have been used safely for years to reduce anxiety or stress in fearful patients. What’s more, Dr. Tillman is happy to address any concerns you might have before your procedure. Then, on the day of your appointment, we will monitor your condition all throughout your visit, in accordance with strict safety protocols. If you have a respiratory disorder, you take certain medications, or you have recently undergone surgery, you may need clearance from your doctor prior to using sedation dentistry.